The Douglasville-Douglas County (Ga.) Water and Sewer Authority (WSA) has been delivering quality water and wastewater service to more than 90,000 Douglas County residents for over 17 years. Its slogan—“Award-winning service for our local community”—is much more than just advertising jargon. Over the past 17 years, its honors have included three citations from the U.S. Environmental Protection Agency (EPA) for best wastewater treatment plant in EPA’s seven-state Southeast region, two citations from EPA for best wastewater treatment plant in the nation and one award for best overall water system operation in EPA’s seven-state Southeast region. In addition, its water and wastewater treatment plants and laboratories have been named best in the state on numerous occasions by the Georgia Water & Pollution Control Assn. (GW&PCA). And in a taste test sponsored by GW&PCA and EPA, Douglasville- Douglas County water was named the Best Tasting Water in Georgia for 2003. On the flip side from all the accolades are the complaints coming from the neighbors immediately surrounding the WSA’s Southside Water Pollution Control Plant about nuisance odors from the plant—a familiar problem in the wastewater industry. As is often the case, the increase in complaints about offensive odors was due more to urban sprawl than to any additional odors being created by the plant. The plant was originally built in the late 1970’s in a largely undeveloped area. Eventually, developers built a subdivision in the vicinity. Since the early to mid 1990s, the subdivision has continued to grow, and houses have been built closer and closer to the utility. One of the offending odors causing complaints was the naturally occurring odor given off by a properly operated activated sludge plant. “It’s got a musty dirt smell, which typically isn’t offensive, but when you’re not used to it, it can be,” said Lee Smith, superintendent of the Southside Wastewater Treatment Plant. Also, odors given off during the treatment of biosolids, between operating the digestors and belt filter press, were believed to be the more obnoxious odors that WSA received complaints about. Though this did not occur all of the time, the odors can be considered a nuisance by neighbors. The increase in complaints was directly related to increased population in the area surrounding the plant. Nevertheless, the number of complaints was up and, as a responsible neighbor, WSA had to do something about the odor. In June 2003, based on a referral from another wastewater utility, WSA decided to try out Ecosorb natural organic odor neutralizer. WSA is finding success throughout the entire plant, including in particularly odorous areas such as sludge handling. 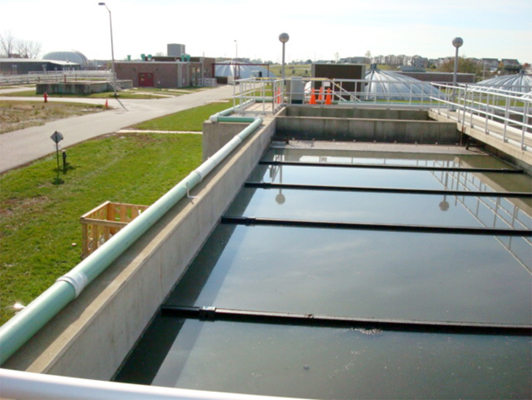 The Douglasville utility treats between 2.5 and 3 million gal of wastewater per day. It uses a concentrated form of Ecosorb, which it dilutes with water and spray into odorous areas in an atomized mist. The ratio varies between 1 and 1.5 gal to 55 gal of water. 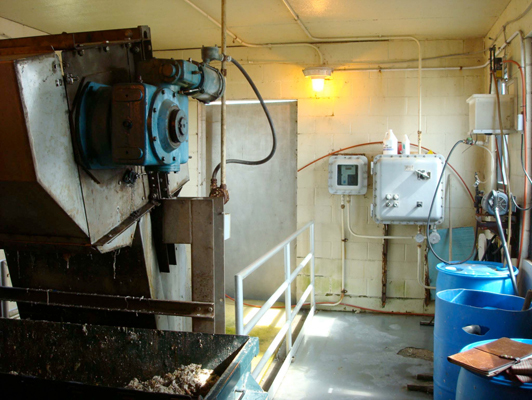 A 5-gal supply of concentrated Ecosorb typically treats odors at the plant for 10 days to two weeks. When atomized, the droplets electrostatically attract the molecules that form the odor and then capture and neutralize them, diminishing their volatility until they are reduced to their lowest possible form. In this way, Ecosorb eliminates the odors rather than simply masking them with fragrances or harsh chemicals. It is effective with odorous gases, including hydrogen sulfide, sulfur dioxide, ammonia, ethyl mercaptan and methyl mercaptan. Ecosorb is suitable in a wide variety of applications, from commercial settings to processing plants. 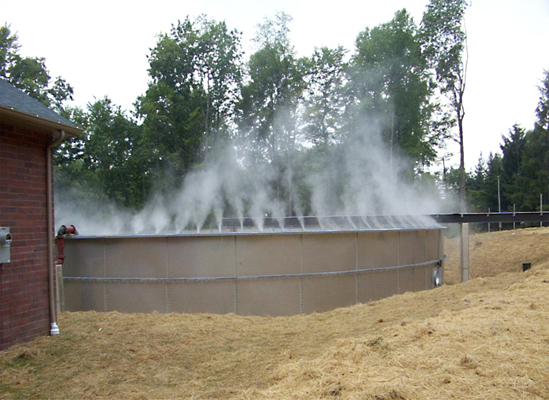 Each Ecosorb system is custom-designed for its unique application and facility. It is non-toxic, non-hazardous and biodegradable. It contains no volatile organic compounds and is safe for both humans and the environment. It has been tested according to EPA guidelines and authorized for use by the U.S. Department of Agriculture.